Freshwater pearls, with a twist, in the shape of smoky, opaque Fire Opals tinged predominantly with a whisper of blue, but also reflecting hints of gold as you move. 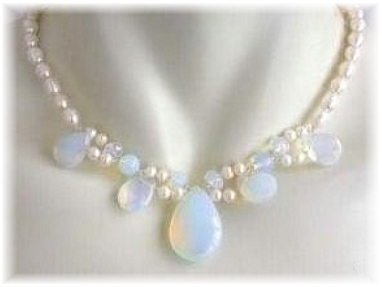 The centre Blue Fire Opal is a teardrop shape and at the sides, circular Blue Fire Opals are attached to the freshwater pearl chain shapes. Pearls continue right to the lobster clasp closure. Length: 46cm (18").